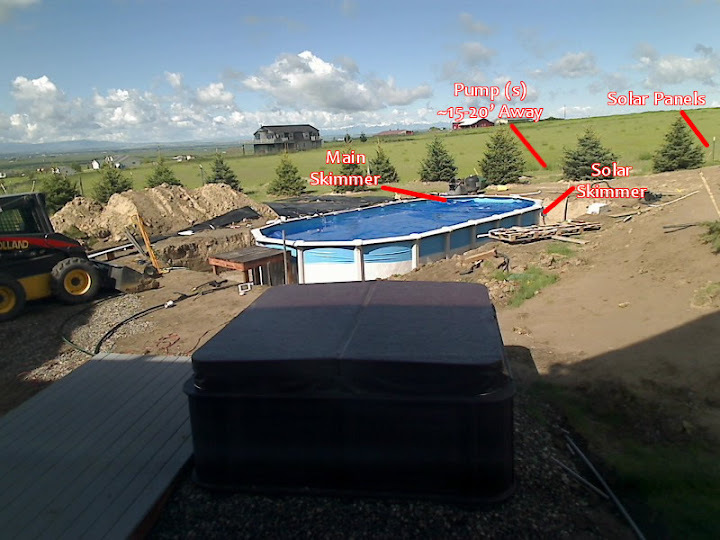 Just finishing up my pool install before I build the deck over it, and I am a little confused on the right parts for plumbing everything. I'm good with 2" PVC lines, elbows, etc, but where I get confused is what kind of valves I need for startup/shut down, etc. The pumps (one for main stuff, a separate one for the solar setup) will be just slightly (less than a foot ad the intake) above the waterline, but above it nonetheless, so air lock can be an issue I think. I'm planning on putting a ball valve on both sides, but how do I plumb everything so I can release the air in the lines on start up and prime it? It's a 1.5hp sta-rite pump connected to a typical sand filter. Is it as simple as plumbing in a relief valve into the system? Or is there some other way to deal with it? Obviously, in season, best bet is to shut the valves to keep the air out when doing any servicing, but I'm talking in the beginning of the season, or when ever is necessary. What about making a P trap, so to speak, come out of the pool, and make a U before going up and out? You need to use a self priming pump. A self priming pump which will take care of everything you need. Most above group pool pumps require that all of the plumbing have water it in before the pump is turned on. That is impossible to achieve when the pump is above the water level. A self priming pump is able to raise the water from the pool up to the pump even if there is mostly air in the pipe. It is often nice to have a ball valve on the supply from the pool and another on the return to the pool, though they are not required. Well bummer. I wasn't really wanting to buy a new pump. I have the option to locate the pump below the water line if I carry it out another 10' or so, maybe that's the way to go. If it weren't for the solar side, I'd just locate them below the deck and add an access, but I have to run pipe anyway, so it doesn't save me anything, other than $50 worth of pipe. May I ask why 2 pumps anyway? I know one is going to the solar array but not sure why the need for a separate pump to the solar instead of diverter valves, either manual or automated? Just asking - thanks! No huge reason, actually. I've been running the solar separately since I set it up, and just like to be able to control both "sides" of the system independently. Mainly, it allows me to run the solar pump (a 2500gph intex) at different times/intervals than the main pump. That helps me be able to maximize the solar stuff, and minimize the big pump use (I'm not upgrading to 2 stage until this one dies), and if there's a water quality issue, I could run the main pump all night if I wanted, which I'd NEVER do on the solar side because it cools down to sub-50 and even sub-40 overnight around here, so I have to max out the solar impact. The intex was cheap too. Ok, makes sense. Was wondering since we have a diverter valve on our plumbing to the solar so if I need to run all night I just open the diverter and it bypasses the solar - we get REALLY cool at night too! Tonight we are forecasted to 45 deg - close the windows! I actually still like for them to be separate. I currently have them on 2 different timers.